Lausanne, Switzerland, October 15, 2015 – Beach volleyball will reach new heights over the next 12 months with 28 events set to take place around the world after the tentative schedule was announced on Wednesday. The provisional 2015/2016 calendar has been released by the World Tour Council in an effort to confirm the events, with the fully approved schedule set to be announced at the end of October. A total of 28 events are taking place over a 12 month period including the Swatch Beach Volleyball FIVB World Tour Finals, six Grand Slams, three Swatch Beach Volleyball Major Series events, eleven double gender Opens and three single gender Open events. As a result, almost $10,000,000 in prize money will be awarded. An additional event between June 7-12 may also be added by the FIVB ahead of the deadline for the calendar at the end of the month. Additionally, 2016 will see the return of the FIVB World Continental Cup Olympic Qualification tournament as well as three Age Group World Championships as the FIVB looks to develop the sport across all ages. The Rio 2016 Olympics take place from August 5-21, with the iconic Copacabana Beach, arguably one of beach volleyball’s spiritual homes, host to the Olympic competition. The beach volleyball competition runs from Saturday August 6 until Thursday August 18 when the men’s medals take place. The women’s medals will be decided a day earlier. Earlier in the year Rio will also host a Grand Slam from March 8-13 and it comes soon after the season-opening Vitoria Open tournament from January 26-31 and Maceio Open that runs from February 23-28. This will be joined by the FIVB Beach Volleyball U17 World Championships which will take place in Cabo Frio, which sits 161 km from Rio de Janeiro airport, from June 12-17. The World Tour will also visit Iran for the first time with the Kish Island Men’s Open whilst the FIVB Swatch Major Series will return for a second year, with tournaments in Gstaad, Porec and Klagenfurt. The line-up for Rio will be complete when the final side per gender qualify at the FIVB World Continental Cup Olympic Qualification that take place in Russia from July 5-10. A further team per gender per Confederation will reach Rio through the five (5) Continental Cup Finals, which will be played from June 21-26. Aside from Rio there are five other Grand Slams, with the Netherlands aiming to build on the overwhelming success of the FIVB Beach Volleyball World Championships 2015. The promoter will confirm this latter event by the end of October. Moscow and Long Beach will host Grand Slams and two others are set to be played in Poland and the United States. There will be three new sets of age-group world champions per gender, at U17, U19 and U21 level. The U17 World Championships will take place in Brazil from July 12-17, the U19 World Championships in Larnaka, Cyprus from July 26-31 and the U21 in Lucerne, Switzerland from May 11-16. The Swatch Beach Volleyball FIVB World Tour Finals will be continued after their successful introduction in 2015. The 10 leading men and women’s teams will fight it out for the medals and bring the curtain down on the 2016 season from October 25-30. 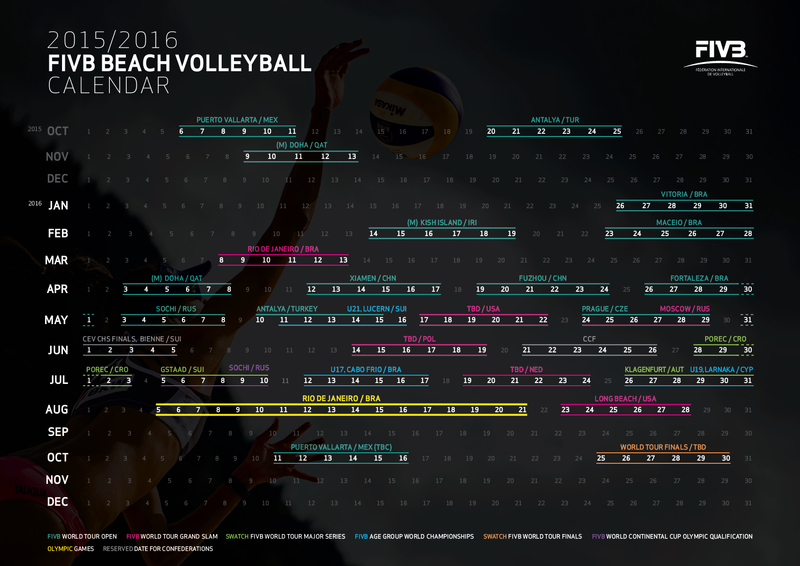 By the end of October the FIVB will disclose the official 2015/2016 calendar.